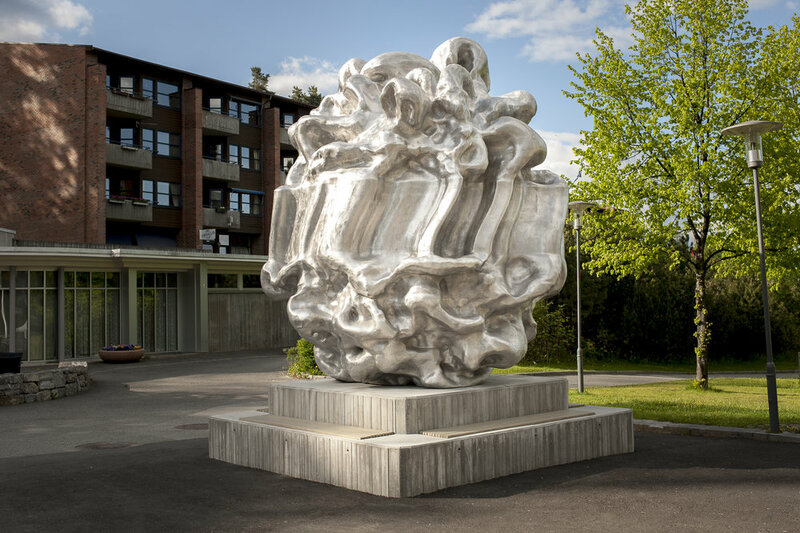 Artist Richard Deacon has created an amalgamation of his impressions from Gjøvik in the form of a five-metre high sculpture in sand cast aluminium. Gripping is enthroned in front of Fjellhallen in Gjøvik. Created in an abstract artistic idiom, at first glance it appears to be virtually an undifferentiated mass. It does not depict a specific shape and if we approach and move around it, it gives the impression of being composed of different elements that have been melted together. Associations of stone and mountains are immediate, and Gripping can be viewed as a site-specific commentary. Fjellhallen is known for its climbing walls and the sculpture’s title Gripping emphasises a requisite when climbing: maintaining a firm grasp on the hand- and footholds. But references to the factory O.Mustad & Søn in Gjøvik are also hidden in the title. The factory produces fish hooks, paper clips and nails, objects that are designed to grip and hold. And although we cannot see it directly, the climbing walls, the paper clips and the fish hooks are all elements in the artwork, melted into a composite whole. 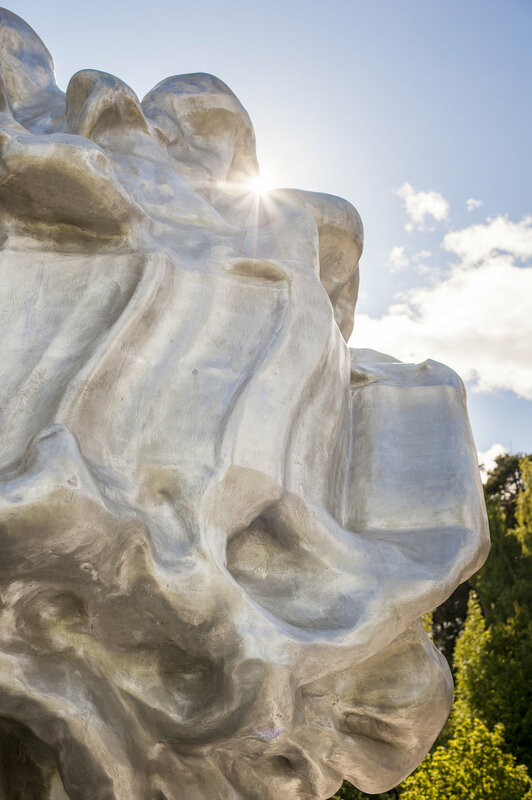 The forms, functions and variations of hooks and fastenings created the background for Deacon’s work with the sculpture. Gripping is made of sand cast aluminium, and also the choice of materials carries with it references to fish hooks and paper clips from O.Mustad & Søn. With Gripping Deacon has virtually done the reverse: combined all of the different objects into what greets us in front of Fjellhallen: an abstract and multifaceted sculpture that offers new impressions from every angle. The British artist Richard Deacon is internationally well-known and has won a series of prizes. In 1987 he won the Turner Prize which is awarded annually to a British artist. His public sculptures are to be found throughout the entire world. Deacon often employs different materials in his sculptures: wood, steel, aluminium, iron, marble, vinyl and leather. Independent of his choice of materials, Deacon works within an abstract expression, often with organic forms. The sculptures can produce associations of anatomical and uniquely human features in the viewer. A city centre, a rural village and nature constitute the municipality of Gjøvik in Oppland, located right by Mjøsa. The municipality is a leader in industry. The iron and metal industry is important in the municipality and the factory O.Mustad & Søn is known as the world’s largest manufacturer of fish hooks. Gjøvik also has a rich outdoor and cultural life. Fjellhallen was built for the 1994 Winter Olympics and since the installation of two new climbing walls in 2008, this has become one of inland Norway’s best climbing centres. – The space between these constructed climbing walls was particularly fascinating to me and could perhaps be characterised as exemplifying or analogising the gap between nature and culture, image and object. The richness of metaphorical associations between fish hooks, hair grips, pins, paper clips and nails is breath-taking.